Somehow, almost 10 years later, I remember the moment during orientation when you are handed a piece of paper that says which school you are in, your major, minor, and any concentrations. I started at BC in the Lynch School of Education with a Secondary Education major, History minor, and a pre-law concentration. Maybe I remember that moment so well because when I saw that I had a pre-law concentration, even though I was in Lynch, and my overall reaction was how did that get there, whatever, guess I will keep it. Little did 17 year old me know that I would end up transferring to A&S (it wasn’t called Morrissey back then) to major in Environmental Geoscience, double minor in History and Sociology, and keep that pre-law concentration. What would be even more surprising to me back then is that I now work for the Massachusetts House of Representatives for the Joint Committee on Environment, Natural Resources and Agriculture for House Chair Smitty Pignatelli. …I know, what does that even mean is probably what you are thinking? What do you even do in that job? Well, I do a little bit of everything. Literally. But, let me explain a bit about the structure of the State House before I get too deep into anything. In Massachusetts, members of the House and Senate are elected to two-year sessions on the same cycle. At the beginning of each session, House and Senate members are given a deadline to timely file legislation. Typically, sometime in February the Speaker of the House and the Senate President announce committee and leadership appointments. The bills are then sent to committee based on the subject. Each bill must then have a hearing after which the committee will take some sort of action on the legislation. Typically bills are reported out of committee with either a favorable report or they are sent to a study, which effectively ends the bill’s movement through the legislative process. Part of my job is to take the roughly 300 bills the Environment Committee receives and break them up further by topic area like oceans and waterways, fisheries, agriculture, etc. I then work with the staff for the Senate Chair to create summaries of the legislation, schedule hearings, review testimony, and redraft (aka rewrite) legislation as necessary so the Committee members can take a vote on the bill. Throughout this process, we meet with advocates, lobbyists, and constituents (general public) on bills and issue areas to make sure whatever action the Committee takes on an issue, they have received all the pertinent information first to make a more informed decision on what to do. From time to time the Committee will also host briefings for all members of the House and Senate to learn a bit more about a subject we have been working on, whether that be the restriction of neonicotinoids or how the state is managing our waste and landfills. While I do have a master’s degree, my educational experiences at Boston College are continually allowing me to do my job better than I think I ever really imagined or understood. Making the switch to A&S from Lynch allowed me to take classes on international environmental law and policy, US federal environmental law, but also on environmental justice, environmental sociology, ecofeminism, and interdisciplinary classes on how humanities interactions with nature have shaped society over the course of history. My major also allowed me to take classes focused more on geological formations, hydrology, oceanography, and mineral formation. Massachusetts has a long-standing executive order policy on environmental justice that members of the legislature filed as a bill this session to make into a formal law. A representative filed legislation to sign Massachusetts onto the Paris Climate Agreement. Yet another filed a set of bills focusing on watershed management. Working on environmental legislation in Massachusetts is honestly best described as an interesting experience. You hear time and again, sometimes what feels like weekly, how Massachusetts is a leader on environmental issues, or other states are looking to see what is done here on an issue before passing their own law, but then you have the times when you actually discover how many other states are ahead of Massachusetts on some niche topics. 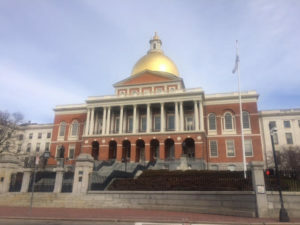 The hardest part of where Massachusetts sits as a leader on environmental issues is that because Massachusetts is a leader on so many policy areas, as a legislative body, the House and Senate can only take up so many bills in a single session. A typically session will have almost 5,000 bills filed. Within that 5,000 there are small, local bills and large, nationally influencing policies. Compounding this is the financial implications of most legislation, particularly environmental legislation. There is only so much money to go around that getting costly bills passed into law can be a difficult hurdle to overcome, which becomes all too apparent during the yearly budget debate. Massachusetts has some of the most progressive environmental laws in the United States, and yet we fund it all with around 0.5-0.6% of the state budget. It makes the work done at the Committee level that much more important. Innovative legislation that can save the Commonwealth money, create jobs, while still protecting the environment will always be attention grabbing. Serafina Zeringo graduated from Boston College with a B.S. in Environmental Geosciences with a double minor in History and Sociology and a Pre-Law concentration in 2012. She went on to earn a Master's Degree in Environmental Policy from the Center for Environmental Policy at Bard College. She currently works as the Staff Director for Representative Smitty Pignatelli, House Chair of the Joint Committee on Environment, Natural Resources and Agriculture. Located in the Brighton area, Serafina regularly volunteers with Boston College and spends her free time exploring New England.